Cold emails or sales prospecting emails are written for a purpose – to build a solid pipeline for your sales executives. But most sales executives make the mistake of expecting that prospects will buy whatever they are selling in the very first mail. No, they won’t. How many of you would give a “positive response” to Jackie’s mail? I, for one, did not. I found this mail in my Junk and recovered it as an example to show how our cold emails read like most of the times. 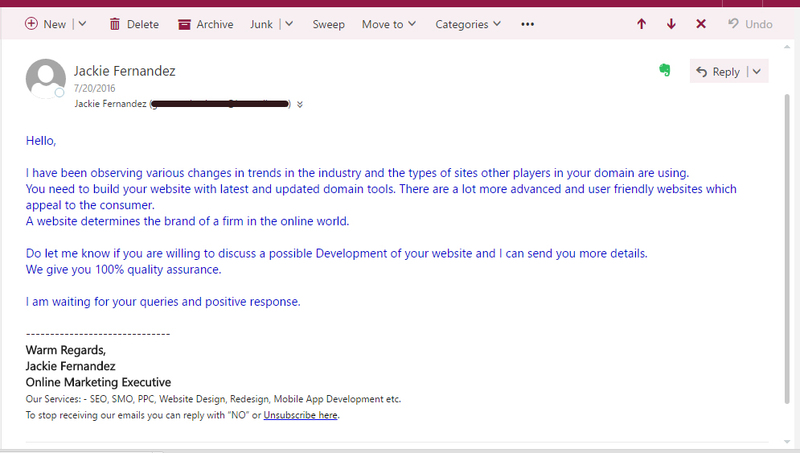 If you will not respond to such a mail, do you think your prospect would even bother? If we want our prospects to care for our mail, it is high time we start caring for them. Here are 5 steps that would help you write cold emails that get a response. Before you even begin to write that mail, you need to know your prospect. Research them online. Have they won an award lately? Have they posted a Job requirement on LinkedIn which matches what you have to offer? What do they Tweet about? What articles have they lately written on their blog? The answers to these questions will help in writing your mail and finding that initial connect with your prospect. First impressions matter! Your subject line is an introduction to your mail. If your prospect does not buy in to your subject line, then you can as well forget about writing the rest of the mail. But now that you have done some research into your prospect, include that information while crafting your subject line. The introductory paragraph of the mail should continue with what you have mentioned in the subject line. You cannot be congratulating them on winning an award in the subject line and straightaway come to your sales pitch in the intro. Find a way to connect the two and you will sound more genuine and more concerned. Personalize your mails to include their names. And while talking about your product/service focus on its benefits than on its features. Keep your email signature simple and legible. Your email signature should have your contact information and a link to know more about you or your company. This may sound the most obvious but is the most ignored step. Either out of sheer laziness or due to lack of time, most of the times we do not read our emails before sending. It is important to read your mails and remove any grammatical and typo errors. Remove repetitive bits to make your email shorter and crisper. As in any relationship, the more warmth we add, the more successful the relationship. It’s time we added some warmth to our cold emails to make them work for us. If you’re looking for a tool to manage all your email efforts from within Salesforce, look no further than MassMailer. It breaks the per day send limit of 1000 emails, and let you keep in touch with your growing subscriber base. With features like templates, stay-in-touch emails, and real-time reports, you’re sure to get more out of Salesforce with MassMailer.